More than a decade of work and research yield results in Islife 8.2, a novel iron chelate that corrects and prevents iron deficiencies even in the most unfavorable conditions. Tradecorp are experts in micronutrients and speciality fertilisers. Founded in 1985 in Spain, Tradecorp has gained broad experience in crop nutrition, which we offer our clients to improve their crops and their business. Irma Dovidaviciene has joined Tradecorp Europe team as the new Baltic Countries Manager. Camila Levy, R&D Agronomical Manager at Tradecorp, will be giving a speech at New Ag Dublin, this March, where she will explain the key concepts of this technology. The EBIC board appointed Carlos Repiso, Biostimulation R&D Coordinator at Tradecorp, to head the Agricultural Committee (AgCom) recently. Tradecorp carried out its trials in strawberry farms with in the province of Huelva (Spain), here, Turbo Root soil activator was applied. This research focused on the effect of the biostimulant and soil activator, Turbo Root for strawberry cultivation. Tradecorp has won 4th place in “Top 10 Novel Fertilizers,” in the AgroPages Awards for its latest innovation, IsliFe 8.2. Launched in July of 2018, IsliFe 8.2 is the first biodegradable iron chelate stable under alkalinity conditions. Longtime client, Oserian Flowers, has won the award for Best Cut Flower Grower of 2019. Visit Tradecorp at Sival 2019, France! Tradecorp announces winners of the Photography Competition – Agrophoto. New “Powered by Humifirst” video! Did you know the agricultural seaweeds market is expected to reach 211 KT in 2020? 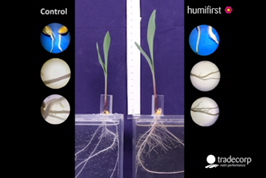 Watch the benefits of Humifirst in root development in our new timelapse video! Global Compact: Tradecop’s Communication on Progress 2016 is now available!